In Murder on Millionaires' Row, Erin Lindsey's debut historical mystery, a daring housemaid searches Gilded Age Manhattan for her missing employer and finds a hidden world of magic, ghosts, romance, and Pinkerton detectives. Rose Gallagher might dream of bigger things, but she�s content enough with her life as a housemaid. After all, it�s not every girl from Five Points who gets to spend her days in a posh Fifth Avenue brownstone, even if only to sweep its floors. But all that changes on the day her boss, Mr. Thomas Wiltshire, disappears. Rose is certain Mr. Wiltshire is in trouble, but the police treat his disappearance as nothing more than the whims of a rich young man behaving badly. Meanwhile, the friend who reported him missing is suspiciously unhelpful. With nowhere left to turn, Rose takes it upon herself to find her handsome young employer. The investigation takes her from the marble palaces of Fifth Avenue to the sordid streets of Five Points. When a ghostly apparition accosts her on the street, Rose begins to realize that the world around her isn�t at all as it seems�and her place in it is about to change forever. As I tell you this story, I�ll thank you to remember that I was young and in love. That�s not an excuse, but if you�re looking to understand what happened on that day in January 1886�what really happened, mind you, not the version you read in Harper�s Weekly or The New-York Tribune�then you ought to have the whole picture. So yes, I was nineteen years old, and yes, I had a blinding crush on my employer, one Mr. Thomas Wiltshire of 726 Fifth Avenue, and those facts together led me to make certain choices in those early hours, choices that might charitably be called naive. Some of the actions I took I�m not particularly proud of. But I wouldn�t take a one of them back, either�which is saying a lot, considering how near they came to getting me killed. But I�m getting ahead of myself. I really ought to start at the beginning, which means I should say a little about where I�m from. If you�re from around here, then you know that in New York, where you come from is everything. It defines your place in the world�your past, present, even your future if you let it. Why, just your name and address tell a stranger pretty much everything he cares to know about you. Not just where you live, but how: what parish you belong to, how much money you�ve got, where your people came from before they were Americans. He can even make a fair guess as to what you do for a living. Your name and address label you a certain type of New Yorker, a creature with particular habits and distinctive plumage, not unlike a species of bird. Black-capped chickadee. Northern mockingbird. Italian fruit vendor. Chinese laundryman. So when I say that my name is Rose Gallagher of 55 Mott Street, well, that�s a whole story right there, and a common one at that. The story of an Irish girl from Five Points. What do those words conjure in your head? A photograph of some fair-haired, reedy thing leaning out of a tenement window to hang washing on the line while drunks and ragpickers loiter in the alley below? Well, you wouldn�t be far from the mark. But there�s more to me than that slip of a girl, just as there�s more to Five Points than the vice and violence you read about in the papers. Oh, it�s a wretched enough corner of the world, to be sure, but it�s home. And it�s where I learned that if you don�t take care of you and yours, there�s nobody else will do it for you. Which brings me back to the day Mr. Thomas Wiltshire disappeared, and everything I knew in the world went spinning down the drain. 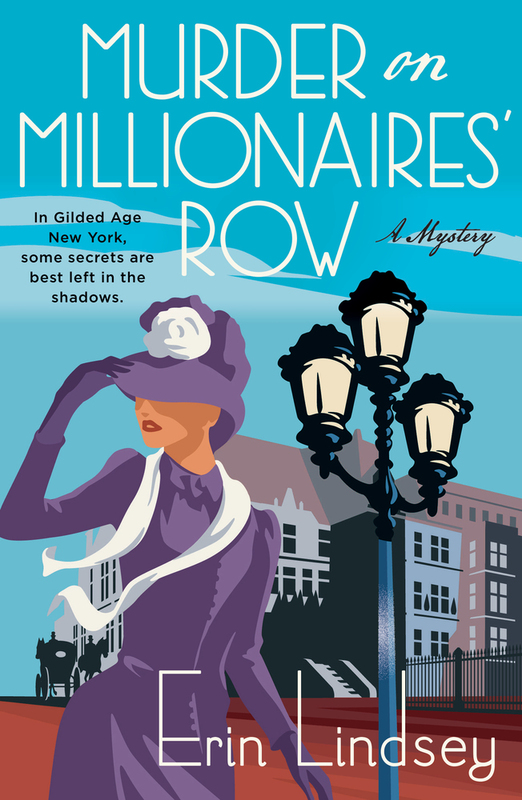 Books � la Mode is giving away one print copy of Murder on Millionaires' Row�yay!! I already bought a bunch of mini pumpkins and decorated them. Also been enjoying all the pumpkin snacks from Trader Joe's, like the almond milk, sugar cookie, mousse cakes, cheesecake, etc. It's been a calorific month! Sponsored wholly by the publisher�a huge thank you to the lovely folks at Minotaur Books! Giveaway ends November 9th at 11.59 PM (your time).